The adventures of a Lazy Girl devoted to making gluten free living easy and delicious! Sometimes I actually crave food that is on the healthier side. My mom always tried to make wholesome meals when I was growing up. Dinner was the one time amidst our hectic lives that we sat down as a family, so it was very important to her to have quality dinners that didn't start from a box. I appreciate this even more now that I am on my own. Most nights of the week, I make sure there is a home-cooked meal on the table for my own little family. There's nothing like catching up on a day's events over food. 1) De-seed, de-rib, and cut the red pepper into thin strips approximately 2 inches long and 1/4 inch wide. Slice the flank steak in half lengthwise (along the grain), then cut into similar sized strips. At the same time, parboil the broccoli in boiling water for about 2 minutes, rinse in cold water and set aside. 2) If serving rice, begin to prepare 1 or 2 cups of rice (I use Minute Rice). 3) Combine all ingredients for the stir fry sauce in a small dish and set aside. 4) Heat 1 tablespoon of oil in a large high-sided skillet or wok. Stir fry the broccoli on high heat for about 2 minutes, or until lightly browned. Remove from the skillet and set aside. 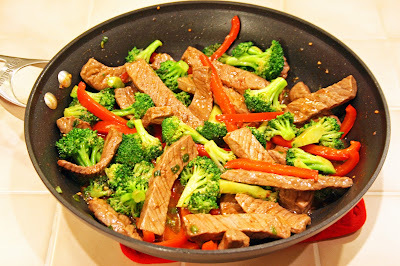 5) Add another 1 tablespoon of oil to the skillet and stir fry the steak for about 2-3 minutes, or until browned but pink inside. Add the pepper and stir to toss over high heat for about 1-2 minutes. 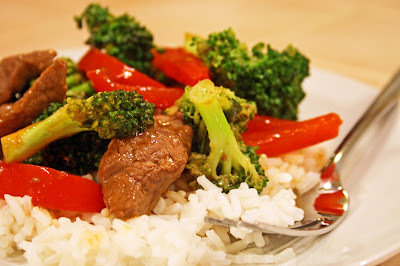 6) Quickly add the cornstarch-water mixture and the stir fry sauce. Continue to cook until the sauce thickens, about 1-2 minutes. Add the broccoli to the pan and toss to coat evenly. Serve with the rice. Very nice recipe! 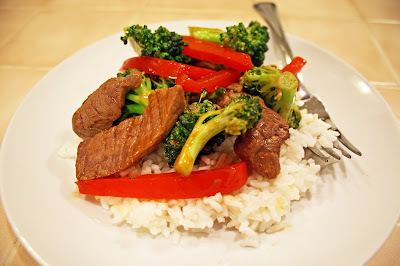 With this post, I can now learn more tips on how to cook my favorite stir fry. Thank you for sharing this to us! Lazy Gluten Free images and original content are copyright protected. Simple theme. Powered by Blogger.